Deluxe room with queen bed, large bay window, Flat Screen Television, DVD/CD Player, ensuite bathroom with full bath. French doors to adjacent single bed. Sleeps a maximum of 3 with existing bedding. This room features a bathroom with a shower, hairdryer and free toiletries. It also includes a seating area with a flat-screen TV, DVD player and an iPod dock. Electric blankets are provided. King Bed, or Singles, leather chairs, flat screen television, DVD/CD Player, port & Chocolates. Ensuite Bathroom with full bath. Includes Full Home Cooked Breakfast served between 8.00 am and 9.00 am in the breakfast room. Consists of a King Bed (or 2 singles) in the first room, and short passage way leads to third single. Ideal for teenage children or an extra adult. Once the school room, now with a nautical touch is our smallest room. Queen Bed, ensuite bathroom with shower and toilet, flat screen television and DVD Player. Hairdyer, Iron and Ironing board provided. Also includes complimentary port and chocolates and a Continental Breakfast. Ideal for the family travelling together. 2 Bedrooms, first room with 2 single beds, Flat Screen Television, DVD Player, leads to main room with Queen Bed, Television, DVD Player, Complimentary Port & Chocolates. A walk through robe leads to the ensuite bathroom with shower and toilet. Included is a Continental Breakfast served in the Breakfast room daily. Rate is inclusive of 4 persons. The Museum of Old and New Art is an art museum located within the Moorilla winery on the Berriedale peninsula in Hobart, Tasmania, Australia. 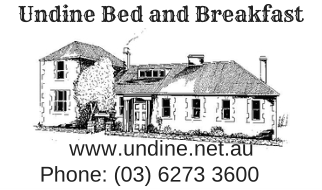 Just a 3 minute drive or 15 minute walk from Undine. It is the largest privately funded museum in Australia. The museum presents antiquities, modern and contemporary art from the David Walsh collection. Walsh has described the museum as a "subversive adult Disneyland."